Discover the freedom of high definition video and digital audio wirelessly. Conveniently place your HDTV anywhere you want without the hassle of installing cables. The Aries Home HD Wireless Sender transmits your Blu-ray/DVD player, HD cable/satellite set top box, PS3, Xbox 360, or PC's HD signal wirelessly to your HDTV/projector. Mounting your HDTV on the wall? No problem. This system will allow you to arrange your living room without being limited by your audio/video devices. Neatly organize your devices on the other side of the room while your HDTV is mounted for premium viewing and an enhanced home theater experience. This bundle includes two sets of the Aries Home NAVS500. Wirelessly Send HDMI Video and Digital Audio Signals to any HDTV - Now you can easily stream uncompressed high definition audio and video all without running messy cables. There is no reduction in picture quality allowing you to experience full 1080p resolution. 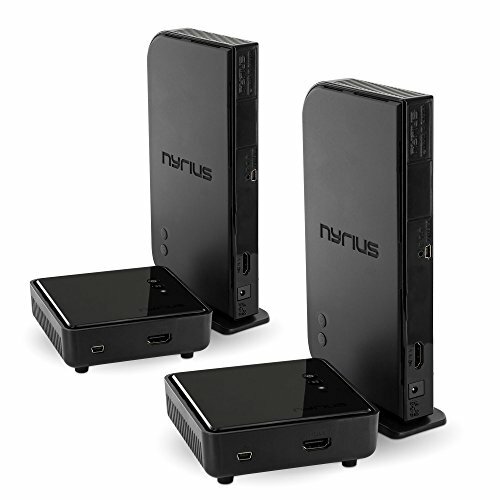 Whether it's your HD cable or satellite set top box, Blu-ray player, gaming console, computer or any other HD device with standard HDMI connections, this device will allow you to watch it on any HDTV wirelessly. Powerful Long Range Digital Signal - This system can broadcast HDMI audio and video up to 100ft. It also transmits through walls, floors and ceilings with ease. Whether your HDTV is hanging over the fireplace, or on the other end of your house, the Aries Home High Definition Digital Wireless Audio Video Sender will broadcast crystal clear digital sound and razor sharp 1080p video without latency. The powerful digital signal will not interfere with Bluetooth or Wi-Fi networks. Works with Most HD Devices - HDTV, Blu-ray player, HD satellite/cable set top box, DVD player, HD projector, desktop PC (Windows/Mac), laptop, Playstation 3, XBOX 360, HD camcorder, DVR, or any other HDMI compatible device.